Not open to the public at Canard. However, we are currently available for tastings at Fairwinds Estate Winery just down the street from our historic vineyard. Canard Vineyard has been quietly producing hand crafted wines for over thirty years. Each year we produce eight unique estate wines: Coucher de Soleil Rosé, Zinfandel, Cabernet Sauvignon, Throwback, Adam’s Blend, The Rescuer, our Reserve Zinfandel and our Reserve Cabernet Sauvignon. All of our wines are produced from dry framed estate grown grapes which are skillfully transformed into the finest expression of each varietal. We are dedicated to creating wines of distinction with an emphasis on quality over quantity. Situated on the Northwest corner of Dunaweal Lane and the Silverado Trail in Calistoga, the twenty-five acre property is considered a historic vineyard in Napa Valley. The property was the original homestead of Captain Reason P. Tucker, who gained notoriety for leading the efforts to rescue the survivors of the ill fated Donner Party. The residence at Canard was built in 1859 and quickly became the center of social activity in the area during the late 1800!s. Zinfandel was planted over 130 years ago and remarkably those dry farmed vines still stand, yielding a small quantity of incredibly elegant fruit which goes into our highly coveted Reserve Zinfandel. Over the years, Merlot, Cabernet Franc, Petit Verdot and of course our Cabernet Sauvignon were planted and have been meticulously cared for using painstaking but extremely effective vineyard practices. Creating wine at this level demands a great deal of discernment and sacrifice and most of it takes place in the vineyard. The result is the culmination of what man and nature can do when they work together in harmony. Rich and Carolyn Czapleski searched for what seemed like an eternity for the perfect vineyard that could grow the red varietals they needed for a world class wine. This quest finally came to an end in 1983 when they purchased what is now Canard Vineyard. Over the years, Carolyn, who is a master gardener and interior designer, transformed the historic home and surrounding grounds into something nothing less then magical. Rich immediately got his hands dirty and tended to the vines. As a true gentleman farmer, his philosophy was simple; “If you take care of the vines, the vines will take care of you.” He has spent the last thirty two years doing exactly that but also allowing the natural terrior to influence the distinctive characteristics of the wine. With the help of winemaker Brian Graham and managing partner Adam Fox, Rich and Carolyn have assembled a small but talented team who share their desire to make the finest wines possible, while maintaining great integrity and respect for the land. 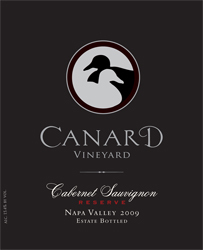 To join the wine club, visit www.canardvineyard.com or call 707-942-1149. Canard Vineyard is certified under the Napa Green Winery Program by the Napa County Department of Environmental Management (DEM) and the Association of Bay Area Government’s (ABAG) Green Business Program and completed all the regulatory components needed for environmental sustainability. These components included developing water and energy conservation methods, preventing pollution, and reducing solid waste. In addition to developing sustainable winery practices, this program is set to become the standard for the state of California. Canard Vineyard is certified under the Napa Green Certified Land Program. Canard Vineyard has created and implemented a customized farm plan with measured results that addressed all aspects of its property, vineyard land as well as non-farmed land, including practicing soil conservation, water conservation, stable drainage, riparian corridor enhancement, fisheries and wildlife habitat enhancement and long-term improvement and sustainability.